Oven Roasted Honey Glazed Carrots are one of the easiest, yet most elegant side dishes that you can make. 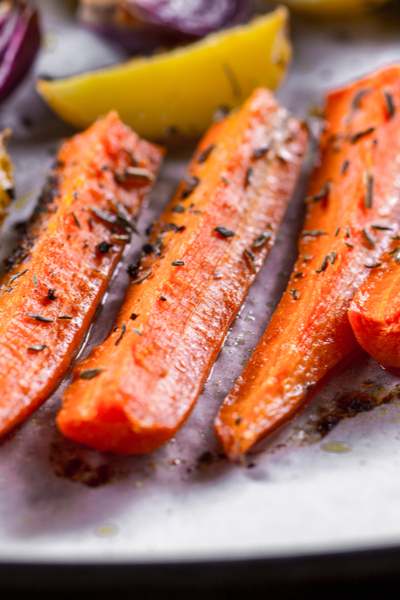 Long slender pieces of carrots are drizzled with olive oil and honey and then sprinkled with salt and pepper. Oven roasted honey glazed carrots garnished with parsley. Throw them in a hot oven and in 30 minutes, you will have the most beautiful and delicious side dish ready to be served. Seriously, that is all it takes! We started making this recipe purely by accident. Unexpected guests arrived at the house right around dinner time. We had already put a roast in the Instant Pot (see: Instant Pot Roast and Vegetables recipe). Although we knew that we would have plenty of roast for our guests, we also knew that there were not enough vegetables to feed more than our family. 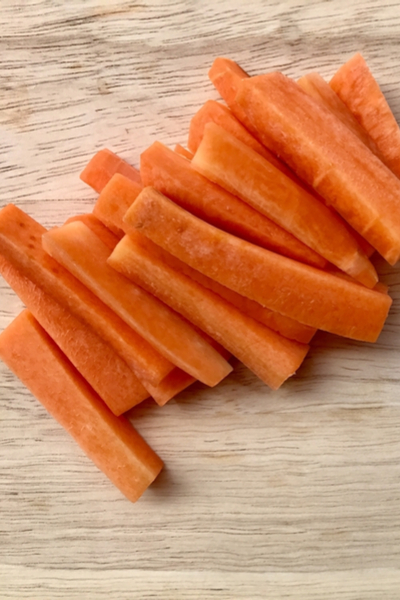 Cut your carrots in large sections for the best results. Not wanting to spend a lot of time away from our guests, I searched the refrigerator to see what I could come up with. Unfortunately, it was just about time to make a trip to the grocery store, so our vegetable drawers were pretty empty. However, I spotted the remaining bag of carrots that I had opened earlier in the day to go with the roast. That is when I knew that I could use the carrots for a stand alone side dish. 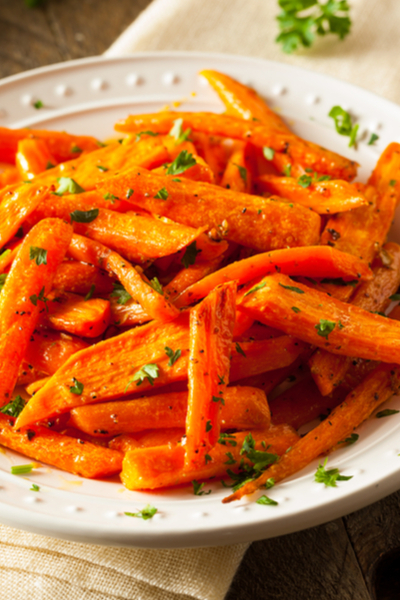 Drizzle honey on your carrots before cooking. I grew up hating cooked carrots. Every time that I tried them they reminded me of baby food. Their looks were deceiving. They were still formed in large chunks. But as soon as you put your fork into them, they turned into mashed carrots. They reminded me of Stage II baby food. YUCK! So I spent half of my adult years avoiding cooked carrots. That was until my husband and I decided to make carrots, our way. 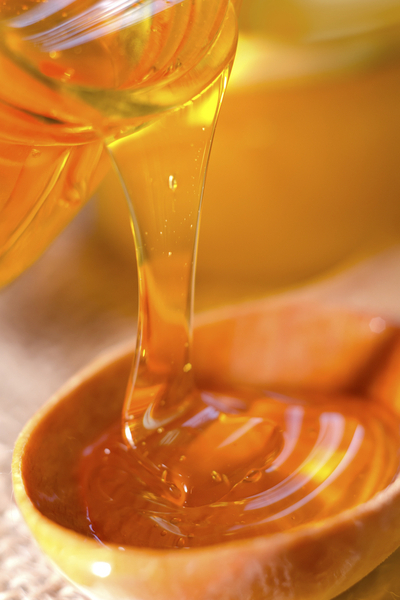 We simply tossed large pieces of carrots in olive oil and drizzled a little of our local honey on top. Sprinkle the carrots with sea salt and fresh ground pepper. A few sprinkles of sea salt and a couple of turns of our pepper mill and we threw them in the oven. A delicious and elegant side dish was born. After putting them in a preheated oven, I became obsessed at checking them every 5 minutes or so in fear that they would turn too soft. I would grab a long fork and attempt to pierce one to see how firm they were. For easy clean up be sure to use parchment paper. For the first 20 minutes my husband convinced me that I needed to keep the oven door shut so that they could cook properly. I agreed and at the 30 minute mark, they were perfect! Easy enough to cut with a fork, but not soft enough to turn to mush when you took a bite. 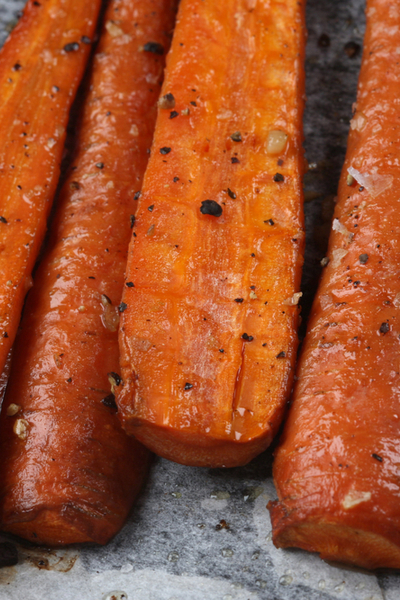 And that honey glaze on top provided the extra sweetness that made these carrots shine! 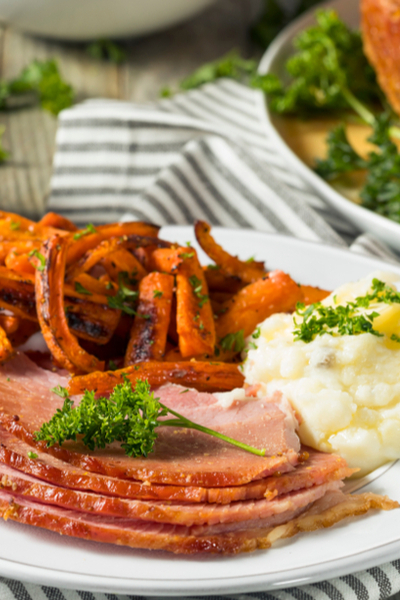 Oven roasted honey glazed carrots served with ham and mashed potatoes for Easter dinner. Now we get asked to bring oven roasted honey glazed carrots to every family holiday dinner! Honey glazed carrots that are baked until fork tender and served as a delicious side dish for any meal. Perfect for any holiday dinner! Wash, peel and cut carrots at an angle in 3 inch long pieces. Cut each piece lengthwise 1 or 2 times to get even size pieces. In a medium bowl combine olive oil, honey, sea salt and pepper. Place carrots in the bowl with the mixture and toss until coated. Spread carrots on a parchment paper baking sheet and bake at 400° F for approximately 30 minutes, or until fork tender.